Ginger's Parrots Rescue, a 501c3 Rescue based in Arizona, is really innovative when it comes to bird rescue. It is the first of its kind. Ginger's Parrots Rescue specializes in Senegal Parrots and Cockatiels. By being a species oriented rescue, Ginger's is able to put a greater amount of expertise and knowledge into rescuing, rehabilitating, and adopting out these parrots. 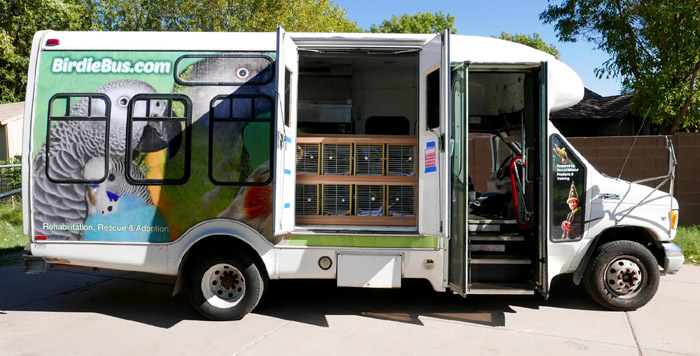 The Birdie Bus is the newest innovation of Ginger's Parrots Rescue. 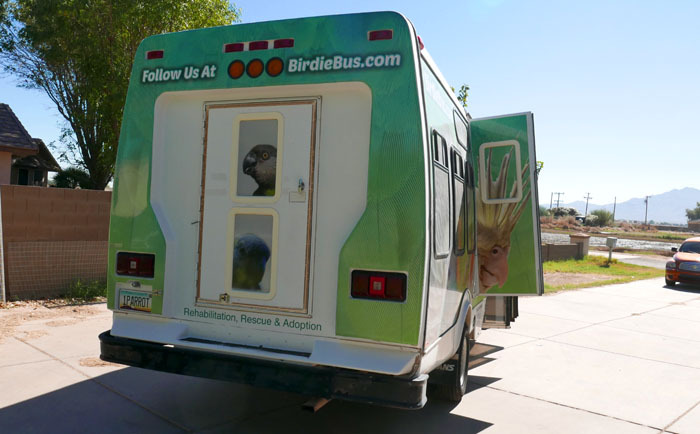 The bus allows the rescue to go mobile and cruise around the Phoenix area to search for potential adopters for the birds in need. 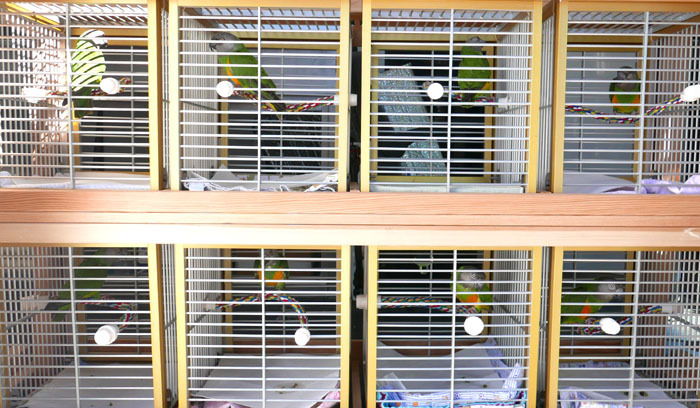 The bus can transport many (but not all) of the rescue's birds at once so that the public can learn about parrots and consider adopting one. Ginger takes the bus to PetSmart adoption days to offer a bird adoption in addition to cat/dog adoptions normally performed inside. The Birdie Bus itself is really cool. It has 4 different doors so that the bird can get an outside experience in safety. The side and rear door open exposing the bird cages to the outside. Viewers can see and interact with the birds while the cages are securely locked inside the bus. There is also plenty of capacity for moving a tent, tables, chairs, and other items needed at rescue outings. 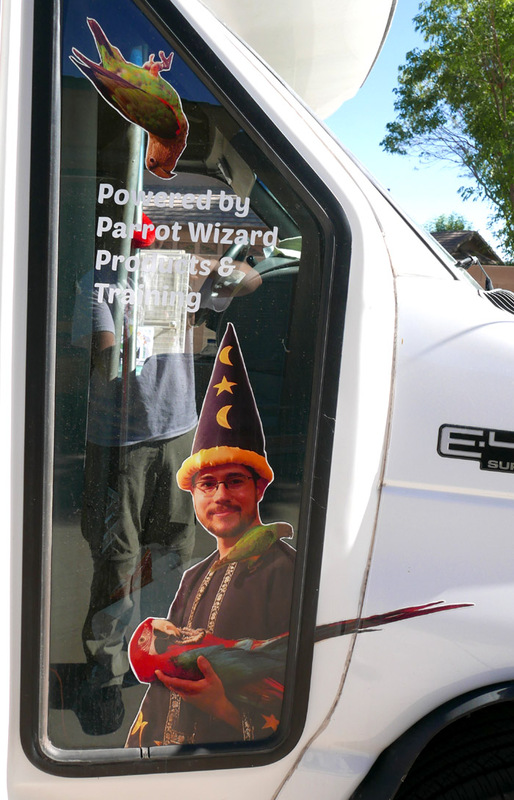 I went down to Phoenix in November to help Ginger with the Birdie Bus unveiling event. Bird owners from the local parrot community stopped by to show support and people looking to adopt or volunteer came by as well. Three purposes are served by the Birdie Bus. The first is to get birds out of the rescue for socialization and fresh air. Even if a bus outing does not result in adoptions that day, it is still a victory for the birds to gain experience being out of the rescue and seeing new people. The second purpose is to help the birds find adopters. This is a chance for the birds to meet people and people to meet the birds. Folks going shopping who may have always wanted a parrot have the opportunity to realize that bird adoptions are available! The third goal is to solicit support for the rescue project through donations and volunteers. The bus is fueled not only by gas money but also through a lot of help. The bus does a good job at attracting existing bird owners out of curiosity. They aren't always the best candidates for more birds if they are at their capacity, but having experienced bird owners volunteering is also a big help to the rescue. There are several ways you can help the Birdie Bus project. The best way is adopting a parrot from Ginger's Parrots Rescue. If you are anywhere near Phoenix and looking for a Senegal Parrot or Cockatiel, this is the place to adopt! Also, Ginger can always use help from local volunteers. But just because you're not adopting or don't live near Arizona, doesn't mean you can't help. The bus needs corporate sponsors, donors, and social media support. If you can send some money, the bus is in need of repairs, maintenance, upgrade, and gas. The rescue is non-profit and depends entirely on donations. Your support will help the rescue get these birds seen by the public and promote the concept of adoption. Finally, even if you don't have any money to spare, you can help by spreading the word. As more people hear about the rescue and the Birdie Bus project, they may choose to adopt, donate, volunteer, or spread the word and the Bus can drive on! Thanks for your help. It has been about 3 months since I rehomed Santina (the rescue Green-Winged Macaw) to Lori. So, Marianna and I flew to Pittsburgh to visit Santina and Lori for the holidays. Lori lives near Pittsburgh. This is close enough that we have the chance to visit her and Santina now and then, but from New York it is still quite far. By car, this is 6 hours each way, but by airplane just 2 hours. This is still a committed all day sort of trip, but a day drip nonetheless. We were greeted in Pittsburgh with snow flurries and bitter cold after a challenging flight through the same weather. We agreed to stay quiet walking into the house to see how Santina reacts to each of us. Marianna went in first and I heard Santina greet her with an enthusiastic "Hi!" I walked in and there was no denying that Santina remembered me. In no time she had her foot up, asking to step up. I was a little hesitant at first because if Santina forgot me, I could have been met with a vicious bite. She enjoyed some head scratches on my arm, danced around, and played with toys. While it was easy to get her to step up onto my arm, it was a bit of work getting her back off. She would cling on and be very reluctant to get off. Lori walked in, and Santina couldn't be happier. All of her favorite people in one room. Incredibly, Santina was great with everyone. When I had her, Santina was much a one-person bird. Everyone else was so afraid of her that it was quite difficult to get other people to train her to open up to people. But, since Lori had no other choice but to train Santina, Santina finally got to learn to cooperate with multiple people. Once the bird is friendly with a handful of people, it's no longer a stretch for that bird to learn to be friendly to all people in general. I could tell that Lori has done a fantastic job training Santina. It took Lori only a few weeks getting Santina to adjust and be good with her. Using training, treats, and patience, Lori had Santina stepping up and allowing head scratches in a very short time. All the time since was developing their own personal relationship and lifestyle. 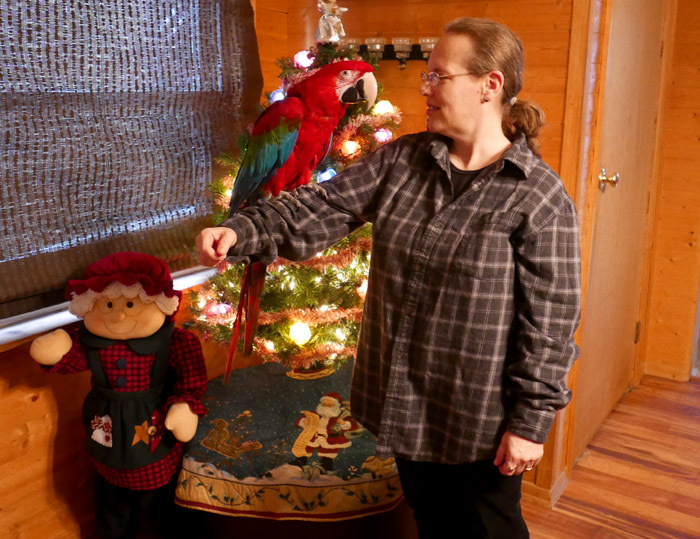 I can tell that not only has Santina adjusted to a new home but Lori has adjusted well to life with a parrot. We weighed Santina and were really happy to see her weight is spot on. She has a good appetite and has been eating well. Lori has done a good job balancing the feeding Santina was accustomed to with her own variety of foods. Lori demonstrated how she cuddles Santina on the couch as part of their routine. Then it was time to open presents. Santina was nervous of the wrapping paper so I let Lori try with her. They worked on it together and Santina grew the courage to open it herself. A giant foraging toy for sure! Santina ripped all of the wrapping paper to find a bag full of tasty nuts. The Senegal, the Cape, and the Macaw! So it's been 6 months since I adopted Santina; but it's also been a few months since the macaw was introduced to the other two. I'd like to take a little time to talk about the flock dynamics that are emerging. Initially, Kili had been an only bird. Then for a short time she shared the household with a budgie and eventually with Truman. The dynamic between Kili and Truman had always been where Kili was boss. Kili could take any perch from Truman at any moment. Truman got used to being the "little bird." Now things changed yet again with the addition of another bird. Whenever considering the addition of another bird it is absolutely essential to consider how this bird will fit into the existing flock structure. You can't just simply say "I want this kind" and disregard whether existing birds will agree or not. When it comes to Kili, I know that she will bully any bird that is smaller or several times her size. This is why when I got Truman, I was only considering birds that were bigger than her that could handle the aggression. Even at triple her weight and 1.3x her size, Truman tends to lose most fights to her. Santina is obviously much bigger than the other two but her personality also plays a big factor. She's not aggressive, she's slow, hulking, lazy. These qualities make her a lesser threat to the existing smaller birds. In fact, she would not go after them and they could out fly her any time, even if she could fly. So that's one side of the issue eliminated. On the flip side, the biggest danger is if the little guys put themselves in the way. Initial introductions were to build favorable first impressions, start peacefully, and get the birds used to being around each other without causing trouble. However, beyond this early acceptance, the rest they have to work out on their own. This happens little by little through experimentation as the birds cross each others paths (whether intentionally or inadvertently). Nuts are a great device for making birdy friends. Since they require some focus and take time to crack, it gets the birds focused on a task and away from each other. This is how I initially introduced Kili & Truman to share a perch and lately Truman and Santina. The only trouble I ran into was that Santina finished her hazelnut quickly and started to pry Truman's nut out of his beak and scared him. The trick is to keep them busy with more nuts or to separate the birds before any trouble can erupt. This gives them a chance to get used to being around each other and not have aggressive thoughts. As sitting near each other begins to work, trick training the parrots on the same perch is also a great idea to teach cooperation. Another thing that greatly improves the flock dynamic is taking the parrots outside together. Even if enemies at home, they tend to stick together outdoors against all the other mayhem. This socialization experience builds better bonds between the parrots that you bring home with you (with time). I've been taking the parrots out two and sometimes even three at a time. I put them down on fences or benches in close proximity to each other and keep them busy with training and food. They behave very well together in this type of setting. Interestingly, Truman was never scared of Santina (more than triple his weight and size) from the very beginning. Kili, the bird that fearlessly bullies Truman, stays away from Santina. Kili is a true bully, she'll only pick fights she knows she can win. Truman on the other hand is the bumbling dodo. Truman will cross Santina's path thoughtlessly. And I want to reiterate that he's doing this in a non-aggressive way. When Kili goes after Truman, you can tell it is with malicious intentions. Truman on the other hand, doesn't actually go after Santina but he walks by her entirely focused on whatever he is after. Truman does not notice the far bigger macaw perched there and brushes right by her. His behavior comes off as bold. But his boldness is not in him thinking that he can take on the bigger bird but him not thinking at all. This is how Truman lands himself in trouble all the time. Kili & Truman went down to Coney Island for the second time. They met up with their parrot friends and had a great time. They flew at the beach, ate at Nathan's, played with loads of people, and took a ride on the historic Wonder Wheel, a Ferris Wheel landmark built in 1920. The birds had a fantastic time. Not only did they get sun and fresh air, but also an incredible socialization experience. Instead of talking about it, I'll let the pictures and video share the story. For you parrot owners living in New York City or nearby, here is a new facebook group with announcements for future live parrot adventures in the city. You have to be a New Yorker to join and there are a few key rules to follow. For more pictures, check out Dave's photos of the day and Sonny Mushy's facebook page. And be sure to follow the Trained Parrot Facebook page for daily photos and posts about adventures not worthy of an entire article. And as promised here's the video of the whole adventure!